The item appears as a common sack cloth about 2ft by 4ft in size. 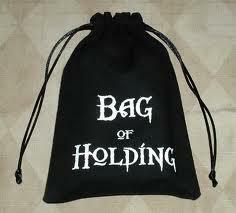 The bag of holding opens into a non-dimensional space: its inside is larger than its outside dimension. Retrieving an item is a full round action. 3 ft sword melee att d8 +1 / 2 Cl v corporeal or incorporeal undead + half dam as cold.